Norfolk has suffered the loss of many of it’s larger country houses but the smaller houses often not only survived but were much cherished as manageable but beautiful examples of local architecture. Yet, even today it’s possible for one of these lovely red-brick homes to slip into dereliction, at risk from the weather and criminals; Bessingham Manor has become another of these sad examples. Built in 1870 for the Spurrell family, who had farming connections in Suffolk going back over 500 years, the house originally had 52-acres but this has now been reduced to a more manageable five. The house remained in the Spurrell family until the last member died in 1952. It was then bought by Robert Gamble who eventually found maintenance a significant challenge which was compounded by a poor quality roof repair which failed leading to massive water damage to part of the house, including the collapse of sections of the second floor. The near derelict state of the interior is mirrored in the exterior which is partially supported by scaffolding or probably held together by the extensive ivy. Perhaps questions should be asked as to why this gradual decay was not spotted by the local conservation department who may have been able to force repairs before the damage became so extensive? It was in this sorry state that the house was finally put up for auction in September 2009 with the agents, William H Brown, who optimistically thought it might go for around £900,000 – despite a likely £1m bill to fully restore the house. Unsurprisingly, it failed to reach even the reserve of £640,000 from a starting price of £400,000. To compound the problems, thieves also broke in and stole a fireplace from one of the ground floor rooms. Despite this the agents have continued to try to find a buyer but with only limited success. By the beginning of 2010, there were three offers on the table. Two were from individuals looking to create family homes but worryingly, one of the offers still in the table was from a developer looking for a commercial project – which is probably an inappropriate enabling development. With all the wealth still available and our nation’s ostensible love of older buildings, it is sad and mystifying as to it’s been so difficult to find a sympathetic owner. Once restored the house would probably be worth several million – so if someone has approximately £1.5m needing a profitable use then this would be the ideal opportunity; just please do it sensitively. Despite the initially pessimistic outlook and the subsequent challenges, Bessingham Manor has survived, and more than that, is nearing completion of the restoration – see this comment left on another Country Seat article by William Hickey. This shows that the analysis of developers should often be taken with a measure of scepticism, especially where heritage assets are involved. The rescue/restoration of Bessingham Manor is to welcomed and the owners congratulated for their success. This entry was posted in At Risk, Comment, for sale, News and tagged architecture, At Risk, bessingham manor, buildings at risk, conservation, country house, development, english heritage, for sale, heritage, houses, listed, norfolk, restoration. Bookmark the permalink. 36 Responses to How did Bessingham Manor get into this state? It’s now off the market! Potential purchasers may be discouraged from making a substantial investment because the house is only being offered with 5 acres of land, rather than the original 52 acres. Was Bessingham Manor known to be ‘at risk’ by English Heritage or SAVE before the sale last year brought it to the public’s attention? Was Bessingham Manor Robert Gamble’s sole residence? Are there any procedures in place to have local council conservation staff perform inspections of listed buildings, say every 5 years, with the inspections becoming annual if their condition is below a minimum standard? Obviously this would take a lot of human resources, but could be manageable if combined with volunteers. If the listed building is not the owner’s sole home, with necessary repairs not completed within a reasonable time frame, should there be laws forcing the sale of the property to someone who can show the financial ability to perform the repairs? This would be different from ‘compulsory acquisition’, which requires the council or heritage bodies raising the funds necessary to purchase the property. I think what’s rather shocking about Bessingham is that it does appear to have slipped under the radar. Although, in an ideal world, we would have the resources to maintain a careful watch on our architectural heritage, the sad fact is that there are few votes and therefore little incentive to devote much money to it. I can see the attraction of a ‘compulsory sale’ but I fear it would be very difficult in practice – how neglected, how to prevent abuse, how to stop someone (developers?) making life difficult to force a sale? That said, it’s certainly not impossible so perhaps someone ought to explore it further. Being the new owner of Bessingham Manor I have read the bolgs here with some interest, yours in particular stand out. The house isn’t listed, having been constructed in 1870 and of only modest design, English Herritage dismissed an appeal to get it listed in 2009 out of hand. We hold a full set of the original architects plans, the construction of the house was significantly “cheapened” from leaving the drawing board to it’s actual construction. I note that you seem to have a dislike of developers, why is this? Many a country house and manor have been rescued from certain ruin by developers working carefully with Council Officers and English Heritage. Indeed I am one and unfortunatley Bessingham is too far gone structurally and poorly located within its’ plot for it to be anywhere near viable to save. We have worked with the village and the Council in order to come up with an alternative house that improves on the 1870 house and also makes reference to the C18th and Mediaeval houses. The existing house will be recycled to provide the materials for the new house and the whole venture will attract a buyer with sufficient resources to maintian and keep the house for generations to come. If you looked at the history of the manorial site in Bessingham this will be at least the third time this has happend. 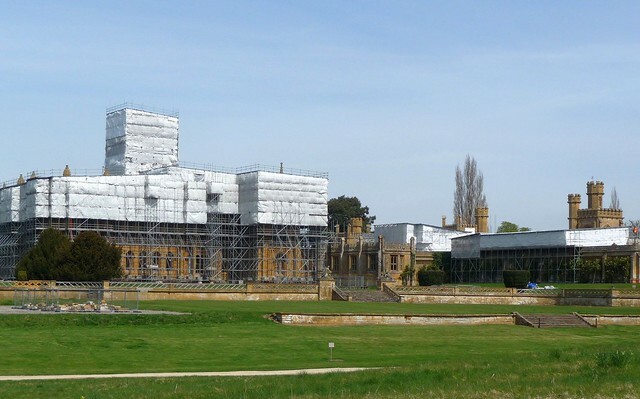 All the documentation surrounding the granting of consent for the re-construcion of the Manor are available on the NNDC website, including the structural engineers report. I applaud anyone that highlights issues regarding our built heritage, there ARE too few protections in law. We have refurbished and own many listed properties, however, sometimes situtions are not always as straightforward as we would like them to be. If the project is approached sympathetically and with proper research into the historical context of the building then many options can be divised for their retention, re-use or even their re-construction. Thank you for getting in contact and your detailed response. I do recognise that Bessingham Manor may not be best example of a neglected house as it is unlisted and there are concerns about it’s architectural qualities but my concerns are particularly around the apparent failure to prevent the house getting into such a condition. I suspect that EH refused to list it because, by 2009, the house had deteriorated to such an extent that little heritage value remained. That said, it is still a good looking house and the apparent poor quality of the construction doesn’t negate that. We should also remember that many Georgian town houses were only intended to last 50-100 years – but they’re still doing very well with appropriate care and maintenance. Speaking generally, developers get a bad press as too many of them are apparently not interested in the heritage or architectural value of the buildings they acquire beyond what it may add in marketing cachet to the brochure. That said, some such as Kit Martin have done some marvellous work to sympathetically convert houses whilst retaining as much of the original fabric as is possible. If only all developers were like this I would be the first to defend them – and I’m happy to in cases where this happens. However, if developers persist in seeking to sacrifice our architectural heritage, either by compromising the house or its setting, then they deserve to be criticised. I understand that Bessingham Manor is in a very poor state – I’ve seen the photographs – but I do still feel that the option to demolish is simply taking the easier route and re-using the materials doesn’t excuse this. This building is a product of its time, it is part of the local architectural history and with care and deep pockets it could still be saved. Perhaps it’s not the most profitable route but it is the one with the most architectural integrity. I recognise that you are approaching this with good intentions but any reconstruction would not be a historic house – and it may run the danger of being a pastiche of the original. It is the quirks and faults that give a old house character and it seems a shame to lose them. A house can captivate someone to the point where they are willing to spend money beyond what they would recoup by selling just to save a house they love – and this is something which no developer can ever consider. I guess we shan’t agree but I hope this clarifies my opinions. Thanks again for commenting. There are ways to introduce basic inspections without spending tax payers money, such as requiring the listed property owners to pay for the inspections, something like an MOT certificate for cars. Alternatively, architects, surveyors and real estate agents could be required, as a condition of their business licence, to perform a certain number of initial inspections (based on their size of operations), which could also have reciprocal benefits for them in terms of future business and contacts. Trained volunteers and professional inspectors could then perform follow-up reviews for the more serious or disputed cases. This could be organised and monitored via an automated online password protected database of listed buildings. In regards to ‘how neglected’ and ‘how to prevent abuse’, varying lengths of time could be given to fix the problems (e.g. 1 to 5 years) based on their severity, with resident owners being given more time than non-resident or multi-home owners. Surely it is better to force a sale to someone with sufficient financial resources to properly maintain the building, rather than let it decay away into a ruinous state. Also, naming or identifying unknown problems may motivate owners to start addressing the problems, especially with the ultimate threat of sale. It seems ridiculous that the law prevents quick demolitions of listed building, but allows their slow disintegration. How many more Bessingham Manors or Gwrych Castles does there have to be before something is done about this pathetic situation. Have any of the people commenting, or the writer, visited and inspected the property? What’s the structure like? The house is still private property so it’s not possible for the merely curious to have a look round – much as I’d love to. I don’t know if the local conservation officer has been around but I’d suspect that they might have now paid a visit in light of the publicity. From the photos I’ve seen, and I’d emphasise that I have no expertise in this, it appears that the house is basically sound but requires significant remedial work from a new roof down to drying it out and reinstating the damaged floors, walls and plasterwork. Not a small task but undoubtably worthwhile in the long-run to secure such a charming house. They may even be able to buy back some of the original land to enhance the value even further. The house is NOT structurally sound – it was the worst house I had ever seen. The back section has totally collapsed. The facade is the best bit! The house isnt really there! This isnt a case of a bit of pin piling or underpinning – it is start again. I have been around. The structure is absolutely terrible. Half of it isnt there. You basically cant look around as it is unsafe. Plus – as one of the other comments says, they are selling with only 5 acres – but that is at the BACK of the house – so in the front, after a small terrace, you look accross someone elses paddock and within that view, there is a large agricultural building. The reason it has been so difficult to find a buyer is that the price was way too expensive. It is a rather small house and you can buy something similar DONE for £1.5m so why bother with all the effort. I actually thought the guide price was out by a factor of 2 – and that it should have been guided at £500k . I presume they found a buyer at the £650,000 level but thats a bit of a bad guiding mistake being out by a factor of 50%!! I have just found this blog and am pleased that there is so much interest in our architectural heritage, and in particular Bessingham Manor. I am currently writing a book about the Manor, which was owned by one branch of my family for 100 years. It was built in 1870 for Daniel Spurrell (d. 1906) and then passed to his son Edmund Denham Spurrell (d. 1952) and grandson Ronald Victor Hitchcock (d. 1970) before being sold to Robert Gamble. The Bessingham estate had been created in the late eighteenth century by Daniel’s grandfather (my great-great-great-great-grandfather) John Spurrell. Although the focus of my book is the history of the Manor, I am also keen to reflect on its present state and possible future. This blog has helped me understand the structural problems the new owner will have to deal with. Thank you for your comments. Further information about my research, as well as my contact details, can be found on my website: http://www.spurrell-genealogy.com. The latest news I heard about two weeks ago was that it is down to one final buyer who is in the process of completing. They intend to restore it as a family home and are currently working through the planning process to secure the necessary permissions. I really wish them well as it is a massive project but the end result will hopefully be the rescue of another piece of local heritage. Sad to see the old Manor falling down i was born in the village at Little Brig and grew up with the the manor and the squire. Thank you for your comment. If you have any childhood memories of the village and the squire that you think would interest me, please feel free to contact me: jonathan@spurrell-genealogy.com. My research into the history of the Manor has put me in touch with many former and current residents of Bessingham and they all have fascinating tales to tell. Matt and Andrew, I applaud your enthusiasm and committment. But in this instance I’m afraid I’m with the owner Tim on this one. Matt, you have a list of vanished country houses, a number of which appear as successive replacements, if not always on the exact spot, reflecting the latest in architectural and artistic taste. As Tim says, EH/DCMS declined to list it, presumably because it had insufficiant heritage significance. Someone with the courage and funds to commission a replacement building of quality will be adding to the country’s stock of ‘future heritage’. Recycling the site materials is common sense, sustainable, pragmatic and honoured by long practice. Much of Renaissance Italy was the product of the recyling of Roman marble of the Classical era. There are so many listed buildings needing saving still and so many whose significance has never been recognised or assessed that need our attention. Thanks for your comments. I was a little surprised but I can see your argument – but I still feel that more should have done to save Bessingham whilst they had the chance. This is a clear example where local people need to make the local preservation societies, civic organisations and national architectural campaigners such as SAVE Britain’s Heritage, the Georgian Group, the Victorian Society etc aware of any notable building which is at risk in their area. It does seem a bit of an anomaly to be arguing for a moratorium on replacement country houses but I think in our modern society where it can be all to easy to set a precedent which is then ruthlessly exploited by those without any appreciation for our architectural heritage means that, short of complete loss, the default position should be that a house should be saved. We shouldn’t be making life harder for the council heritage officers by opening up a new front in the battle to save our country houses by suggesting that if a house becomes neglected that owners have the option to demolish and rebuild. This is especially true as most wouldn’t be looking to sensitively reuse the materials but simply create more ‘Sandbanks’-esque monsters. Bessingham Manor is not the strongest case to use as an example but it is a useful vignette of the arguments that might be played out if a larger house was in a similar position. Dale, I’ll reserve judgement on Bessingham until I see the design of the proposed replacement. My comments above were more directed generally at derelict listed buildings, which would not now need urgent saving if they had been required to be maintained, rather than just allowed to rot away, such as Gwrych Castle. I must confess that I initially overlooked the fact that Bessingham was unlisted, but feet that it may have had more of a chance for listing now, if it had not been left to fall apart. Yes, the key lies in my use of the word ‘quality’. A pastiche ‘referencing the earlier houses on the site’ in modern materials and construction methods has the potential to be, as the SPAB Manifesto puts it, “a feeble and lifeless forgery”. better by far to follow Morris’s advice on redundant buildings: “if it has become inconvenient for its present use, to raise another building rather than alter or enlarge the old one”. ‘Gummer’s Law’ as PPG7 (Sustainable Development in Rural Areas 1997, amended 2001) came to be known, which includes the policies relating to new development in the countryside, reads “‘an isolated new house in the countryside’ may be justified if it is ‘truly outstanding in terms of its architecture and landscape design, and would significantly enhance its immediate setting and wider surroundings’. It was intended to provide an opportunity for the architects of today to create works comparable to the great achievements of the past. PPG7 in this respect I think applies to new houses on new sites, rather than replacements, but the spirit of it, in that new works should contribute to the evolving story of English country house architecture is consistent with the SPAB Manifesto. I’m off to have a look at the new design and will post again when I’ve seen it. All best things as ever. OK, well I’ve been to have a look. The application number is LE/10/0590. The house appears to be in a conservation area as conservation area consent has been granted for its demolition. I haven’t time to chase up the relevant CA appraisal but one assumes the house gets a mention and that it is identified by the CAA as making a positive contribution. It would seem the application is for a replacement dwelling elsewhere on the plot, built to almost exactly mimic the building that’s there externally but completely different inside. This is a shame. If spending that much money on a new house, why create a ‘feeble and lifeless forgery’ when a brand new house to a modern design – incorporating, where possible and appropriate, some of the original materials- would be so much better? Sorry Tim. I understand your rationale, it’s just that – as a SPAB Manifesto signatory- I tend to agree with Morris on this one. One example of a replacement country house in the modern style in a historic context that has recently got approval: http://www.bbc.co.uk/news/uk-england-oxfordshire-11082430 There are numerous hits on Google about the case since it’s being built for Rowan Atkinson and it’s in an AONB. While it is a pity that he chose to commission an American (pace Curt!) and not a British architect, it’s a fascinating interpretation of the brief, whether you agree with it or not. One or two have described it as a ‘petrol filling station’- but it is undeniably modern and speaks of its age and the present idiom in architecture. Not everybody likes it but then there were people who thought Chiswick House (the first Palladian house in England) ‘inappropriate’ and ‘un-English’ two hundred years ago. Other documents relating to the application can be found on: http://planweb.north-norfolk.gov.uk/Planning/AcolNetCGI.exe?ACTION=UNWRAP&RIPNAME=Root.PgeDocs&TheSystemkey=73744 (the scanned photos of the existing house, in the Outline Structural Condition Report, pages 22 to 33, are such poor quality as to be useless online). Regarding Rowan Atkinson’s planned replacement of Handsmooth House in Oxfordshire, the current house is certainly no architectural gem, but the images of the proposed new house model appearing in the press are so tacky, that they do themselves no favours, and make it look worse than the present house. I can certainly understand the local residents’ vigorous objections. The New York architect of the proposed house is Richard Meier (http://www.richardmeier.com), designer of the Getty Center in Los Angeles (http://www.getty.edu/visit/see_do/architecture.html), a model for the fictitious Grierson Gallery in Atkinson’s 1997 “Bean” movie (http://www.imdb.com/title/tt0118689). I’m not a fan of modern minimalist architecture, but I quite liked the Getty Center (in its LA setting), so was disappointed with Meier’s efforts on Handsmooth, set in a completely different environment. I see Page 14 of the latest edition of Country Life that landed on my doorstep this morning has another C21st CH advertised for sale. It’s a site with consent, rather than a finished house, but bears comparison with the Handsmooth replacement by Meier, all white render and curtain glass with a pronounced horizontal emphasis. It’s an interesting example (http://www.carterjonas.co.uk/properties-for-sale/ringwood/hampshire/WIN100171.html) as the house it is replacing is clearly of no architectural merit but happens to occupy a rather nice location. I have no problem with bad houses being replaced but if there is any architectural or heritage value in the original then that’s when the presumption should shift to preservation. Yes you are correct – sorry that I didn’t mention this; as at the time of posting images to my site I did not want to disclose the whereabouts of the location. Also see ‘ Drawing Room’ and ‘Ornate Fireplace’ on page 7 in the colour gallery. Sorry weren’t sure how to copy and paste as copyright sign is displayed? – obviously a simple way around this. I wonder if this fireplace was the one mentioned as recently being stolen? Thanks for these Brian – a forlorn last record of an interesting smaller house. £2,000,000 for the site and planning permission to demolish the old house and rebuild a new manor in a similar style to the old manor 100yds from the old one in the centre of the 5 acre site. I wonder what went wrong for Tim? Or whether his plan was always to gain planning permission for demolition and recycled-rebuild and sell on for a profit??! I’ve been playing the lottery recently with a dream of owning the manor. I wonder if there are others out there with the same love of the place that I have. I get butterflies in my stomach every time I so much as think of Bessingham. Bessingham Manor had its asking price reduced by 15% in May from £895,000 to £765,000 (Cockertons and Savills), although the asking price to complete the new house remains at £2m (Cockertons and Savills). While there is little particular architectural value to the Manor House it is a part of the local landscape and is a very nice smaller manor house, with an interesting history.It should still be possible to re-instate it to it’s former self. It seems to me that there are numerous opportunities other than just cold demolition and a re-build. If a group of interested parties could get together with a view to purchasing the property. (is it £695,000?). One thing that jumps to mind is to use the whole project as a training ground in traditional construction techniques, from piece by piece demolition through to reconstruction and final fit out using, as closely as possible, original materials and fixtures and fittings. Am I just a hopeless romantic or does anyone else agree? “Once restored the house would probably be worth several million” Who are you kidding! House sits in only 5 acres of land and not in the middle at that. Stuffed in the corner this house would be worth IMHO £1.75 million tops. People with several million quid like to control there surroundings, you only got to fall out with your friendly farmer neighbour to find pig sheds spoiling your view the next day. As for the new build. Norwich are in the premiership………………..
Jonny, I would assume that Bessingham Manor is still privately for sale, because no ‘Sold’ or ‘Under Offer’ messages appeared on the agents’ websites before it was withdrawn at the end of September. It has been one year since it was launched in October 2010, so I gather the agents’ annual contract ran out. But Bessingham may appear on a new/renegotiated agent’s website in due course. If not, I’m hoping that Tim may chime in with a comment on its status. Bessingham Manor was re-launched last week with a reduced price of £590,000 (£765,000), or for the new-build £1.7m (£2m). Bessingham Manor remains unsold and so developer Tim Schofield of Norwood Homes is scaling down his rebuild plans from 9 to 7 bedrooms (5,500 sqft less in gross internal floor area, with less outbuildings). The site is available at a guide price of £575,000 (previously £590,000) or for the new-build at £1.45m (previously £1.7m).